Search Our Real Estate Listings! Click Here! We know as real estate investors you may have interest in buying wholesale and selling retail as a short-term strategy. This will of course build capital for you to do a number of things such as invest in another business or build wealth by investing in real estate for long-term benefits. Real Estate Investor! Register Now! Furthermore, as a real estate investor you know the benefits of investing with a long-term vision in mind. These include benefiting from tax depreciations and reduction in liability. Appreciation and cash flow are also the excellent long-term strategy benefits. You might be interested in buying houses to rent, apartments, business buildings, or other commercial properties. You will get the information of the motivated sellers with enough time to help them, you'll have time to stop foreclosure, etc. There are millions of investment properties that sell below market value every day. 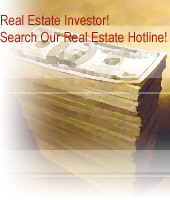 Search Our Real Estate Hotline For Your State Listings! Click Here!